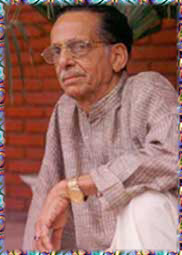 ..:: BHASABHARATHI --> KVALAM -- Profile ::..
Shri Kavalam Narayana Panikkar has carved out a niche for himself in the evolution of a regional theatre movement, which is one of the major components constituting the national theatre in modern India. In a career spanning over four decades, Shri Panikkar has given a new lease of life for the age-old Sanskrit drama tradition on one hand and on the other, he identified the interrelations between the evolved art forms and folk arts, successfully creating a fusion that has enthralled the contemporary audience since then. Shri Panikkar was born on the 28th April 1928 in the picturesque village of Kavalam, part of Kuttanad, once famed as the granary of Kerala. 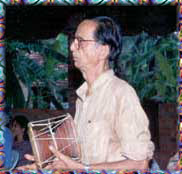 The rustic lifestyle of the agricultural community, closely identified with Mother Nature, the scenic beauty of the area where the sacred River Pampa ends its journey by merging into Vembanad lake-all provided an ideal background for the young Narayanan to develop his inborn artistic talents and vision. He believes that the whole ambience of the area played a decisive role in developing his personality in the early stages of life. Shri Narayana Panikkar was born into a matrilineal joint family where the system made the maternal uncle, the head of the family. This system gave him the first lessons of discipline in life. However, it was his father, late Godavarama, who introduced him to the world of literature. In fact, Shri Panikkar remembers that he was initiated to the fascinating world of great epics like Ramayana and Mahabharata by his father. Moreover, a system of intense and regular reading of the epics existed in the house where his mother, grandmother and women from neighborhood participated. This tradition inspired him to organize poetry reading sessions in public later in life, at a time when it was argued that poetry was for private reading and enjoyment. Shri Panikkar, after his initial education in local schools in Kavalam and in the nearby village Pulinkunnu, joined the famous CMS college in Kottayam, that had produced prominent personalities like KPS Menon and Sardar K M Panikkar, the latter being Shri Panikkar's own uncle. He took his degree in Economics from S D College, Alappuzha and later Bachelor of Law degree from Madras Law College. Taking inspiration from his surroundings and upbringing, Shri Panikkar had started writing poetry from his schooldays. The poems, rich with rural idioms, were the reflections of a young poet's mind on the archetypal imageries, myths and parables that had profound influence on him. After obtaining his Law degree, Shri Panikkar started his career as a lawyer in Alappuzha Bar and practised for six years from 1955. However, he continued to pursue his artistic interests and a breakthrough came when he was nominated as Secretary of Kerala Sangeetha Nataka Academi in the year 1961 and shifted his base to Thrissur, the cultural capital of Kerala. The new responsibility gave him a chance to interact with artists from all over the state and get introduced to different art forms, both Sanskritised and folk-based. He remembers that the tenure helped him to expand his relations and facilitated the growth of the artist in him. Shri Narayana Panikkar's tenure in the Akademi also saw the institution getting more organized and systematic in its functioning. During the period, the Akademi organized many festivals, which gave Panikkar more insights into the rich cultural heritage of the state and its deep rooted and indigenous folk traditions. 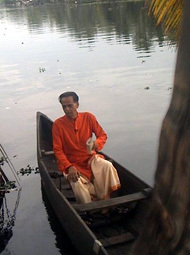 He started his research in the folk and classical arts of Kerala, which ultimately saw him entering the theatre, inspired by folk and classical traditions. Shri Kavalam admits that his first few experiments, to write plays in tune with the established and popular realistic theatre traditions were not successful. But the journey in search of his real identity continued. A turning point in his theatre experiments, especially as a playwright came with the production of "Daivathar". However, Shri Panikkar did not direct the drama, but tried to actively collaborate with directors like Kumara Varma, interpreting his textual inputs to the director. In 1974, Shri Kavalam shifted his residence to the state capital Thiruvananthapuram and a highlight of the period was the staging of his play "Avanavan Katampa", directed by the then established film director Shri. G Aravindan. In contrast to Aravindan's known style of functioning while donning the mantle of a film director, he interacted a lot with the playwright as well as the actors in the production of "Avanavan Katampa". This resulted in what is termed as ensemble acting. The structure of this play and its presentation were truly path breaking. The theme demanded an open auditorium with trees in the background having hanging lamps. The concept of proscenium and picture frame stage with roll curtain divide was broken. The acting area started growing beyond its prescribed limits, creating a sense of involvement and participation among the audience. A major breakthrough in Shri. 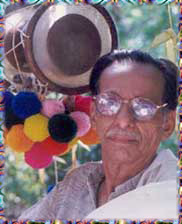 Kavalam's career as a director came when he was offered a chance to produce and present a Sanskrit drama at the prestigious Kalidas Samaroh in Ujjain. He selected Bhasa's 'Madhyama Vyayogam', which was his first directorial attempt. And on November 2, 1978, 'Madhyama Vyayogam' was presented in Ujjain and received with a standing ovation. The culturally sound audience could feel the strength of the Sanskrit presentation, the usage of body dynamics by the actors and their ability to combine the "Satvika" and "Vachika" acting. 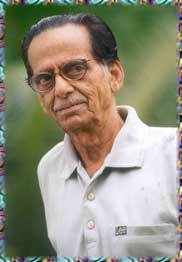 And above all, the directorial contribution of Shri Kavalam. Since the first production of 'Madhyama Vyayogam', Shri Panikkar has enjoyed a special bond with Ujjain in Madhya Pradesh, which has virtually become his 'second home.' Most of the years, his Sanskrit plays are performed here and almost all the debut shows of Sanskrit dramas are organized in the Samaroh at Ujjain. The participation in the Samaroh also gave him and his team an opportunity to get exposed to a wider audience. The impression created in Ujjain had its effect in New Delhi also. Kamaladevi Chatopadhaya, the chairperson of the National Sangeet Natak Akademi, was instrumental in inviting Shri Panikkar to New Delhi and the play presented in February 1979, went to have repeated shows. "Mathavilasom" of Mahendra Vikrama Varman translated to Hindi by Shri. N C Jain and a play written by Shri. 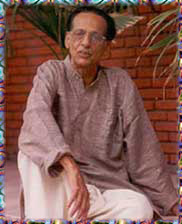 B R Bhargava in Hindi adapting Bhasa's two plays- Pratijna Yogantharayanam and Swapnavasavadatham, require special mention. While dabbling with Sanskrit theatre, Shri Panikkar also wrote and directed a number of Malayalam plays. His first Malayalam play was Sakshi and Kalivesham being the latest. Shri Panikkar's creations, though experimental and non-conformist feature using non-realistic tools, have themes in close proximity to real life, its anxieties, struggles and confusion. This gives a durable nature and make them suitable for Lokdharmi / Natyadharmi treatment. Another salient feature of his plays is the absence of exhaustive use of language as a medium of communication. Instead, the "bhava" or expression is utilized as a powerful vehicle to provide ample space for improvisation as well as interpretation. All the plays are part of the author's experiments to develop the structural patterns and explore its possibilities in the Indian context. He still continues to do the same. Shri Narayana Panikkar has successfully introduced indigenous music of the regional -Sopana Sangeetham- as an organic accompaniment to Mohiniattam. Famous dancers like Dr. Kanak Rele from Mumbai and Bharati Shivaji from New Delhi have worked with him in this project. He has visited many countries, including the erstwhile Soviet Union. He considers his interaction with the Greek Theatre in producing "Iliyayana" as a memorable experience worth mentioning. "Iliyayana", which he produced along with Greek Theatre group Volos, was a combination of Ramayana and Greek epic Iliad. In the project that saw a wonderful fusion of two great ancient cultures of the world, he was supported by Greek director Shri. Spyros Wracorites, two specialists - Dr Ayyappa Panikker and Prof. Andriades, a Greek scholar. This Playwright - Director prefers to call his Kalari, "Sopanam", consisting of 20 artists, as his "Theatre laboratory". His wife Saradamani has been a perennial source of strength and inspiration to him. His two sons Harikrishnan and Sreekumar are also assisting him in his creative ventures, taking time off from their official responsibilities. He lives in Thrikkannapuram on the banks of Karamana River, away from dust and din of the state capital, yet near to the city. He has another house at his native village on the banks of river Pampa an abode he considers as a great source of nostalgic inspiration.